The most important place to begin in CrossFit (or any weightlifting sport for that matter) is with proper mechanics. Mechanics refers to the ability to move properly through core movements. This includes moving your body and external objects in the most efficient, effective, and safest manner possible. In simple terms, you must learn proper form first. Taking the time to learn proper movement mechanics will allow for the proper longterm development as a CrossFitter. Even though CrossFit doesn’t recognize mobility in its 3 part start up definition, it certainly has its place. Consider this, if your shoulders can’t extend to create a locked out position in an overhead press, or if your ankles are consistently a problem when you squat, your body will adapt to those imbalances and create new movement patterns that work around your immobility, this alone will set your body up for an injury. 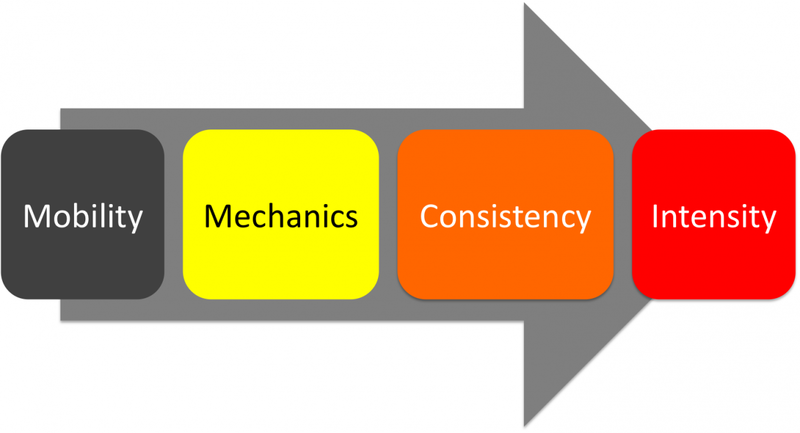 Consistency has a two fold meaning or ‘application’. 2) You must be consistent in your workouts. Both are necessary! If you are only attending classes once or twice per week, you are not going to get the consistent practice you need that is required for your body to develop proper movement patterns. If you are failing in one or the other of these, chances are you will be setting yourself up for injury. Once you’ve developed proper movement mechanics and your body has developed the consistent motor patterns to sustain those mechanics, it is only then that we can add in intensity. Merriam Webster defines Intensity as extreme degree of strength, force, energy, or feeling. For our discussion of CrossFit intensity, this is a relatable definition. However, keep in mind that intensity is relative to our physical and psychological tolerances. Proper mechanics is the safest way to train and solid technique is the most efficient and effective road to fitness. Proper movements allow you to lift more weight, perform more repetitions faster, or both. More work in less time means higher average power (force x distance / time = power). Higher average power means higher intensity. Higher intensity means better results. Proper mechanics are the ideal supports for the bridge to fitness. Without them, your structure is unsupported. Excerpts taken from CF Journal.